Yaxley and Peterborough Northern Star have served up some terrific cup clashes in recent years . . . last night (November 10) wasn’t one of them. However, a smooth 3-0 success in the second round of the FA Vase did provide the perfect introduction to management for caretaker Cuckoos chief Andy Furnell. A brace of first-half goals from the terrific Matt Sparrow put Yaxley in command and their passage was secure long before he laid on a late third goal for substitute Tom Waumsley. It was a night that Furnell, who has been placed in temporary charge of Yaxley following the resignation of previous boss Brett Whaley earlier in the week, could hardly have scripted any better. And Furnell was quick to insist he would like the job on a permanent basis providing his other commitments allow it following a success which earned his club £900 in prize money. 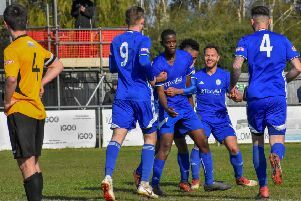 “I’m really pleased with that,” said Furnell, who boasts previous managerial experience after a stint as player-boss at higher-level Soham Town Rangers a few years ago. “We’ve always got the quality with these boys and we know we’re as good as anyone at our level if we can get them up for it. “We have sometimes lacked intensity, but we were relentless and gave Northern Star absolutely no time whatsoever to play. They couldn’t cope with it. “Matt is absolutely unplayable when he performs like he did in this game, but he knows he has to produce that level of performance consistently. for me to do it. Sparrow raced onto a Josh Pike pass and finished impressively from a tight angle to put Yaxley ahead after five minutes. He doubled the advantage on the half-hour mark when seizing on a weak kick from Star keeper Simon Dalton, dodging a poor tackle from defender Christian Gordon and stroking a cool finish inside the near post. Yaxley man Dan Cotton rattled the woodwork twice in quick succession before the break with a low cross and a corner, and the hosts created chances on a regular basis in the second half. Cotton was twice close from the edge of the box before Waumsley placed a free header straight at Dalton moments after being introduced. Sparrow fluffed a fine opportunity to complete a hat-trick in the closing stages but atoned by delivering an excellent early pass into the stride of Waumsley to complete the scoring. Northern Star were lacklustre on a night when they posed next-to-no threat. The loss of defender Wilkins Makate and midfielder Jake Sansby to injuries at half-time didn’t help their cause. One routine first-half save from former Yaxley frontman James Hill-Seekings and dealing with a couple of dead-ball deliveries into his box was the sum total of Cuckoos’ keeper Aaron Butcher’s work. Star’s best chance arrived early in the second half when a stretching Dan Wilson couldn’t steer a fine Connor Pilbeam cross on target. Also involved in FA Vase action today (November 11) are Deeping (away to Godmanchester), Holbeach (away to Walsall Wood) and Wisbech St Mary (home to Norwich CBS).